My girl is double digits. Ten years ago, on April Fool's Day, I went into labor while Peter, Tyler, and I were browsing in a now defunct pet store. Actually, my water broke in the pet store. I know that was more information than you care to know about me, but it explains a lot. Like how our girlie, who is so incredibly animal-obsessed, tried to enter this world surrounded by furry friends. I swear, her animal love began in utero. And it continues to grow each year. Not only is Kristen animal-obsessed, she's an avid tree climber. I'm the tree-hugger, she's the climber. 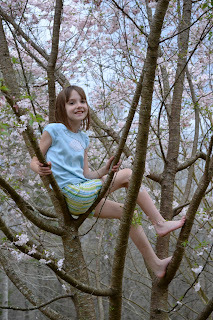 Once, when she was three, she climbed the Japanese Maple in front of our office. "Mommy! Come look! Isn't it beautiful?" My pigtailed princess was nose-to-nose with a black rat snake. Did you know that black rat snakes are excellent climbers? Did you know that, while black rat snakes are completely harmless and are wonderful at controlling pesky voles, they can cause a near-fatal panic attack when viewed by an on-the-ground mother who watches in horror as her three-year-old tries to play with said snake? These are things you should know. But this isn't a story about snakes, or snake-induced hyperventilation. This is a story about a tree. 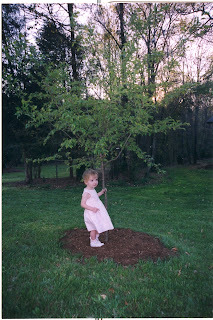 Once upon a time, we planted a tree to celebrate Kristen. 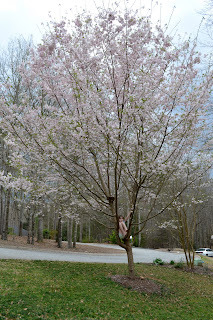 It's an ornamental cherry tree. Today, I'd probably choose something more politically correct--perhaps a cherry tree that actually bears fruit or an ancient heirloom apple tree. 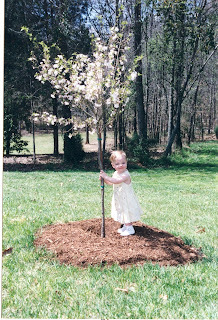 But back then, I simply wanted a tree that would bloom on Kristen's birthday. 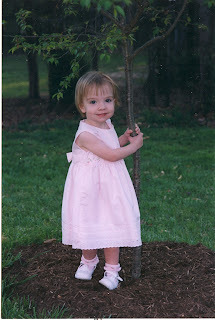 A tree that would co-star in annual birthday photos, charting the growth of both girl and her tree. I'm shocked when I look at my long-legged girl--it seems like two weeks ago that she was an itty bitty thing, shaking the stick-trunk of her tree. 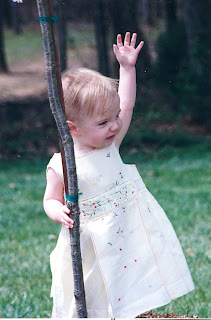 I hope that she'll always find joy in her birthday tree. 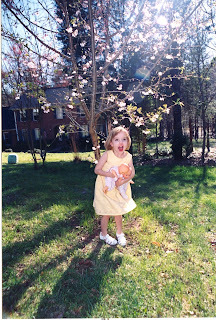 Happy Birthday, my double digit sweet-pea!